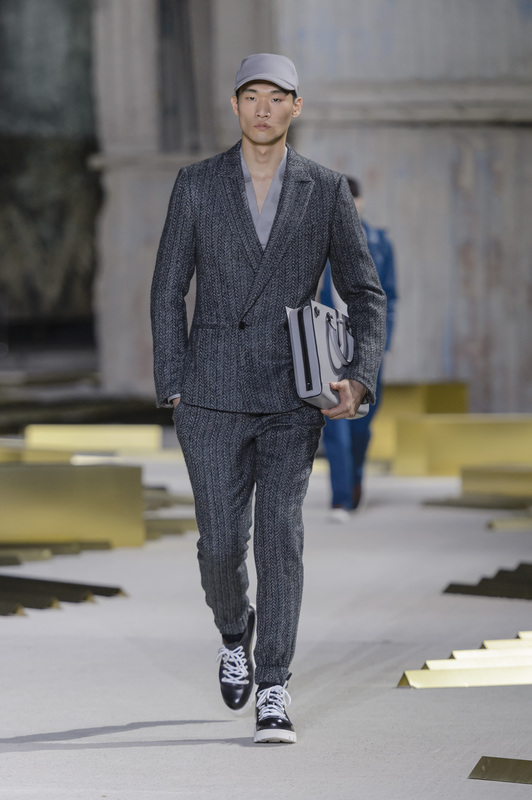 In a merging of the intensely artisanal and the resolutely contemporary, Alessandro Sartori debuts in the role of Artistic Director for Ermenegildo Zegna in a dialogue between the art of exquisite tailoring and the fast-paced needs of the contemporary urban and globe trotter. Out of progressive contrasts – technology clashes with tradition as the outdoors spirit stems from sartorial constructions and sportswear permanently alters the look of formality – new categories arise. The message is synchronic: ease, speed, luxury that’s relevant for the moment and that’s thought to be lived out there. The spirit is multi-cultural, multi-age, and contemporary masculinity. The show is set within the iconic premises of Anselm Kiefer’s The Seven Heavenly Palaces. His brutally poetic, conceptually expansive architectures of pure raw materials and effortless engineering becomes the perfect environment for Alessandro Sartori’s new aesthetic which evolves and breaks codes relying on intense textures and keen constructions that define new functions. 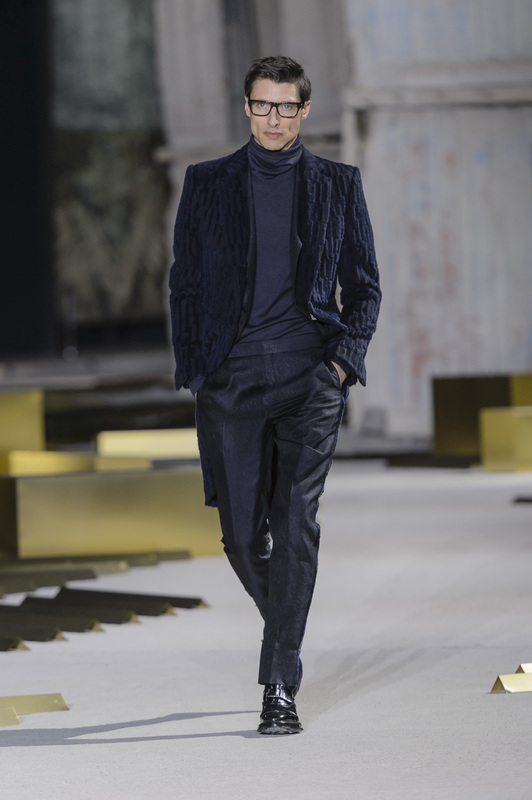 Casentino felt is made with ultralight cashmere, allowing suits to turn into outerwear and the textile research of Ermenegildo Zegna is manifested in the exclusive Trofeo Cashmere denim as well as in felted cashmere jersey and tubular padded jacquards. A special wax tanning process gives baby calf a papery, waterproof feel and a surprising weightlessness. Geometrics jacquard which is hand-drawn and intricate, add a spin to classic suiting patterns. The silhouette is soft and active, defined by the strong line of the shoulders and a natural flow. Inside-out constructions bring functionality to the fore; drawstrings mold the shape of formal coats and field jackets. The proportions of blousons and parkas have a defining lightness. Rubberized zippers close tailored outerwear. In the global shifting, an elegant informality arises. The organic color palette grows from tones of winter white and light grey to notes of camel, vicuna, rusted nail and African earth to deepen into shades of oxblood, pond, peacock green and journal blue. Accessories make a bold presence: active sneakers, sturdy brogues with silicon-dipped soles, outsized portfolios and backpacks, book briefcases. A special loom turns super thin leather strips into a woven fabric: the innovative Pelle Tessuta. To close the circle creating a real dialogue with the customers, in the spirit of Couture the day after the show a selection of looks will be available to order Made to Measure in global stores worldwide, scheduled for a six-week delivery according to the meticulous timeline. 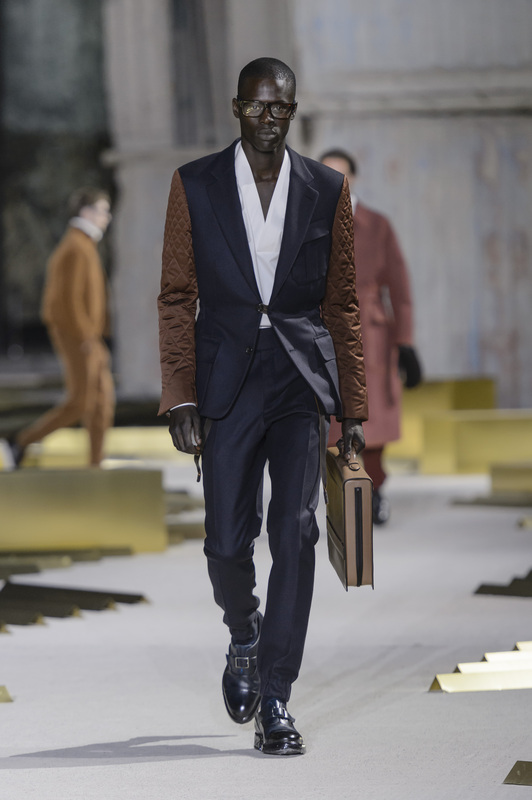 This unique experience expands the reach of the show to a global audience, keeping the authenticity of Zegna values in soulful pieces meant to be really worn.